"This recipe is for those of you who wish to make your own almond paste. I prefer making my own. When I feel lazy, I purchase it in specialty stores. Rose water can be substituted for the almond extract, and can be purchased in Middle Eastern stores, or maybe even health food stores." Grind almonds in a blender. Thoroughly mix in confectioners sugar. Beat egg whites slightly, then stir into the almond mixture. Add almond extract or rosewater (see Cook's Note), using your hands to blend the heavy mixture. If you like, you may omit the almond extract and use 2 teaspoons of rosewater. This recipe is just a little off. It should be 3 cups of powdered sugar and 2 egg whites and a pinch of salt. That works much better. I made this with good results following the original recipe. 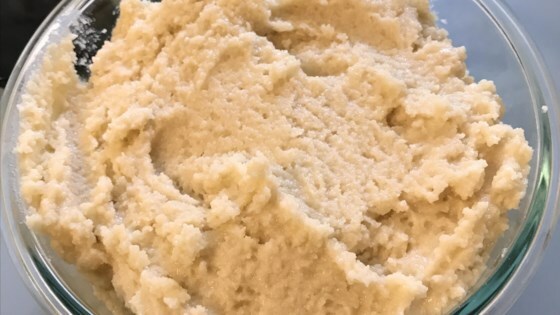 I used this almond paste in an almond shortbread recipe and no one could tell the difference. I haven't actually made this particular recipe. Honey has always been used in my family. It makes a thick paste that is easier to handle and tastes better. Try Almond Paste II. mine turned out AWESOME the only thing i did different was i blended it in my food processor, i haven't used the paste yet but it looks beautiful!